Depart your cruise ship or hotel in Tenerife and set out on an epic land-to-sea adventure! Observe wildlife in the Eucalyptus forests of La Esperanza; marvel at the volcanic landscapes of Teide National Park and snorkel with sea turtles in a secluded bay. This private shore excursion includes port or hotel pick-up and round-trip transport. Pick ups will be either outside the cruise port or hotel. Other meeting points may be requested. Meet your guide on at your Tenerife cruise port or hotel and set out to your first stop – La Esperanza. Stroll through the vast forest, where the Eucalyptus and pine trees tower up to 98-foot (30 meters) tall, and re-fuel with a traditional Canarian ‘barraquito’ coffee (own expense) before continuing on your way. Next, journey through the lava-sculpted landscapes of the UNESCO-listed Teide National Park and stop to enjoy views of the mighty Mt Teide volcano, Spain’s highest mountain. 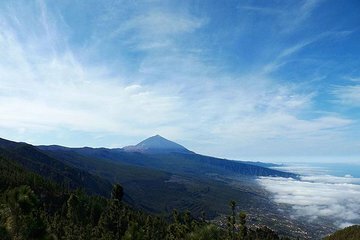 Learn more about the park’s unearthly landscapes at the Teide Visitor Center, then head to the top photo spot – the Roques de Garcia. After posing for photos by the unusual rock formations, and hearing how the rocks got their names (including the ‘Finger of God’ and the ‘Cathedral’), it’s time to head back towards the coast. After another a spectacularly scenic drive, arrive at the small fishing village of El Puertito and change into your swimsuit for a dip in the Atlantic. Dive into the crystal-clear waters and enjoy around an hour to swim and snorkel with the bay’s marine residents – a friendly tribe of sea turtles. After an action-packed day, end your tour with a return transfer to your cruise port.